How close you sleep to your partner reveals a lot about the quality of your coupledom, says a researcher at the University of Hertfordshire. Psychologist Richard Wiseman asked over 1000 people to describe their preferred sleeping position and to rate their personality and quality of their relationship. Sleeping back to back was the most popular position for 42 per cent of people, and 31 per cent said they slept facing the same direction as their partners. Just 4 per cent spend the night facing one another. In addition,12 per cent of couples spend the night less than an inch apart while two per cent sleep over 30 inches apart. The further apart the couple spent the night, the worse their relationship, with 86 per cent of those who slept less than an inch apart from their partner being happy with their relationship, compared to only 66 per cent of those who slept more than 30 inches apart. 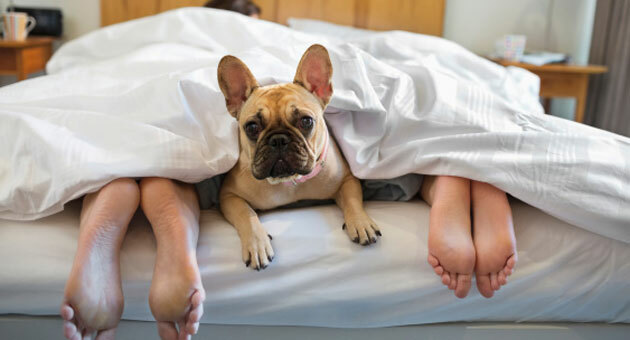 Nothing was revealed about partners who let their dogs sleep between them. However, the research did reveal that extroverts tend to spend the night close to their partners, and more creative types tend to sleep on their left hand side.